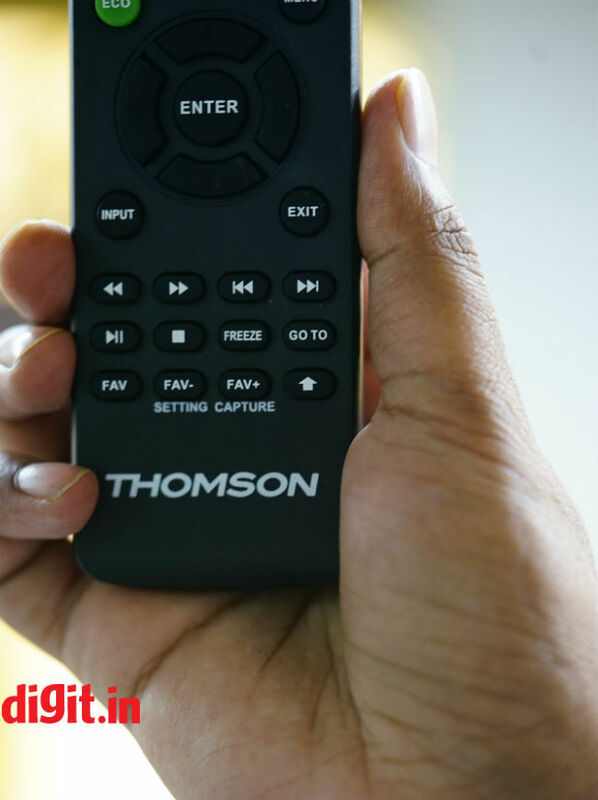 The Thomson TV has good viewing angles, decent sound and works for everyday TV viewing like news, TV shows and the occasional movie. However, the picture quality isn’t great and if entertainment and gaming is what you are looking for, then you are better off increasing your budget. Buying a TV today is a tough decision. There are too many options to choose from in every price range. Add to it the fact that if you increase your budget by a mere Rs 5,000 to Rs 7,000, you will be exposed to a new set of features that will make you rethink your purchase decision. Today we have with us the Thomson B9 40-inch full HD TV. 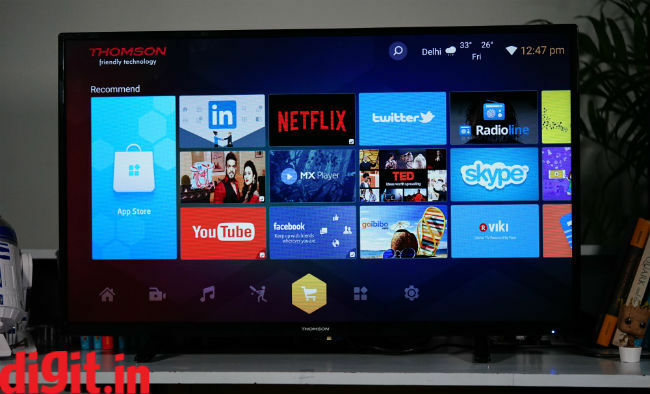 It has a 40-inch IPS panel with full HD resolution and runs on a custom UI based on Android. 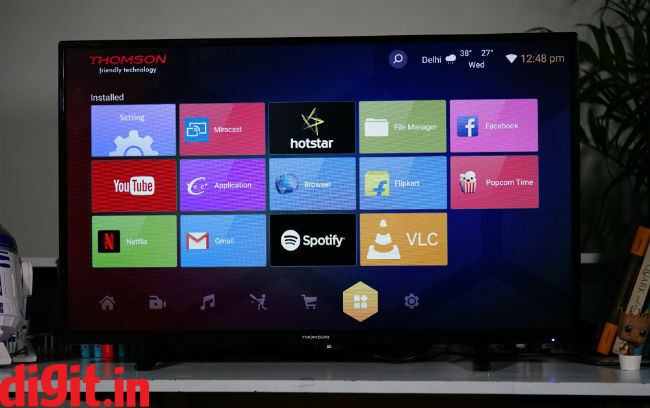 The price of the TV is a mere Rs 20,000. Is it a value for money proposition? Before we get into the review I’d like to clarify one fact. On Flipkart the TV is listed as the B9 Pro. However, customers have complained that when they ordered the B9 Pro, the received the B9. The B9 and the B9 Pro are the exact same TV with the change being in the UI the TV offers. We have the TV with the new UI and the box of the TV says B9. So, if you have the new UI, the name on the box doesn’t matter. A little confusing, I know, but that’s the deal. Kicking things off with the build and design of the TV, it is what you’d expect from a 20K TV. It is all plastic, isn’t very slim (which is acceptable at the price point) and comes with two glossy table top legs. The TV has black borders (bezels) around it and that is ok. The problem is that the bezels are glossy which makes it reflect even the slightest light source hitting it and that can get annoying. The table top stand holds the TV in place well. However, the legs of the table top stand are a little short for my liking. So, if you will put a sound bar or a gaming console that is under 3-inches tall, it will come up till the bottom bezel of the TV which can take away from the immersive experience. Overall, the build of the TV is what you’d expect on a budget. It is plastic, but it isn’t bad. It works well whether you wall mount it or place it on a table. It isn’t he slimmest TV there is and that is OK considering the price. I only wish the bezels weren’t as glossy as they are. When it comes to connectivity, the Thomson B9 Pro has 3 HDMI ports with no ARC support, L&R audio out, coaxial out, ethernet and headphones port at the back. On the side we have the 2 AV inputs along with the 2 USB ports. It would have been convenient to have one HDMI port closer to the USB ports. This would make connecting devices like a Fire TV Stick or a Chromecast a lot easier. 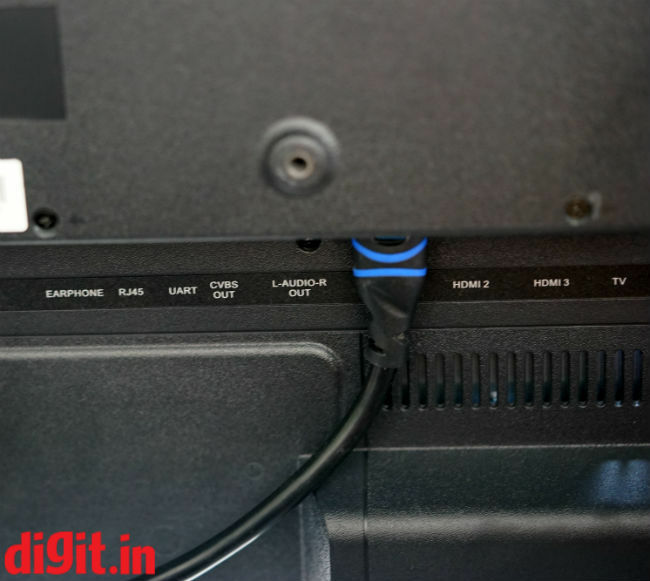 Overall, three HDMI ports are a good number, but the placement of the HDMI ports are all too close for the old Chromecast or Fire TV stick to fit well without an extender. You will need an extender if you need these devices to be placed behind the TV and connect additional HDMI cables. Here’s where things get a little confusing. On paper, Thomson advertises the TV as a Full HD TV which is 4K ready. 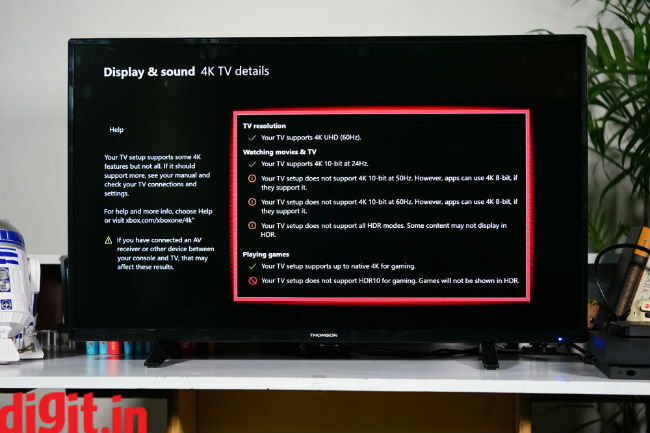 However, when we connected the Xbox One Xand a laptop to the TV, it showed us that the TV can support a resolution of 3840x2160p at 60Hz. It is possible that we are looking at a low grade 4k panel being used on the TV. In an email reply to us Thomson says that the B9 has an 8-bit IPS panel which is made by Samsung. On paper, the TV boasts of a Full HD 1080p resolution. We ran our standard test files on the TV and here’s what we found! As we’ve mentioned above, the Xbox one X recognized the panel on the TV to support a 4K resolution but does not support HDR. So, we played our standard 4K clips on the TV. The Daredevil Season 2 episode 3 fight scene. Before we move onto the quality of the scene, let’s look at the picture presets. The TV offers Standard, Bright, Soft and User presets and the only one’s worth considering are Standard and Bright based on the kind of content you will consume. We drove ourselves mad trying to adjust the settings manually to get the brightness and contrast to the level that we liked and ended up using the Bright pre-set for most of our test scenes. The Daredevil fight scene looked good when we played it on the TV and showed less noise than what we’ve seen on recently tested Kodak 50-inch TV, which is a good thing. Since the show uses more muted colours for such sequences, the bright pre-set worked well. Star Trek Discovery episode 1 also exhibited less than we’ve seen on other budget TVs. However, sometimes the skin tone looked a little off. Our source for the content was an Xbox One X hooked to the TV with a 50MBPS internet connection. Coming to Prime videos, we saw the Grand Tour Season 1 episode 1, the scene where you have a lot of cars on screen. There was a lot of banding here is sequences where you have the same colour in different shades. For example, when the plane is taking off, you have the sky which has a few different shades of blue. The banding in the different shades of blue is clearly visible. This also happens in some moves that have sequences in the night where the intensity of darkness varied depending on the light source in the scene. Overall, if you have access to 4K content from a good source like an Xbox One X, then you can make the most of it. Just don’t expect it to be as good as it looks on the Mi TV. The IPS panel ensures you get generous viewing angles, and good colour reproduction. Considering the price of the TV the fact that the Xbox One X recognises the TV as 4K is a little shocking. Content from Netflix and Prime looks OK, leaving a lot to be desired. If the bandwidth suffers and the resolution drops, be prepared to see a lot of pixels. A lot of content on Prime Videos and Netflix in India is in 1080p. If you will watch a lot of movies that have action sequences in the dark, or dark scenes overall, then you may want to keep the picture setting to Bright. However, if you watch TV shows like Young Sheldon or Grand Tour, where a lot of the sequences are bright by default, then you can change picture settings to Standard as bright may get too bright for some sequences making the content looked washed out or overexposed. Overall, considering the price, the picture quality can be defined as acceptable. It sure has its compromises, but then again, for a price point of 20k you’d expect these. 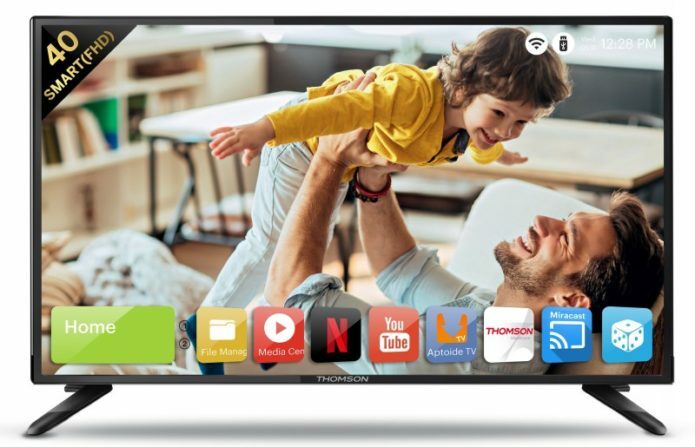 We haven’t tested TVs like the 43-inch Mi TV 4A, Panasonic 40-inch Full HD TV, Cloudwalker 43-inch Full HD TV, TCL 40-inch full HD TV which are priced around 20k, so it is a little hard for us to draw comparisons. Put simply, this TV isn’t for those that are looking for a console gaming companion. There is a lot of loss of details when you play games on the TV. Playing Forza Horizon 3 and Forza Motorsport 7 on the TV, if the environment is bright, you will not be able to see the details on the tyres on of the car. Play a fast-paced action game, like Rise of the Tomb Raider, and you will see moments of stutter and input lag on the TV. If gaming is a priority I recommend investing in a monitor. It won’t be 40-inches but you will get a much better overall gaming experience. The Thomson TV runs on an updated version of the UI we have seen on the Kodak TV. 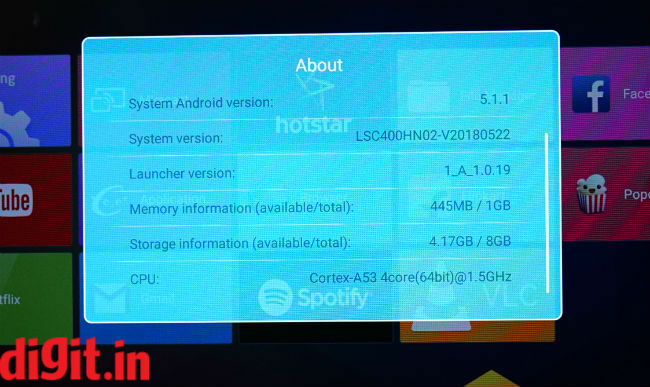 It runs on Android 5.1.1 out of the box, but it has been modified. Press the home button on the remote and you will be greeted with a detailed UI. You have access to Home, Video, Music, Sports, App store and more. The video, music and sports section will recommend popular videos from YouTube where as the app store will show you popular apps like Netflix, Twitter, Skype, Facebook, YouTube and more. 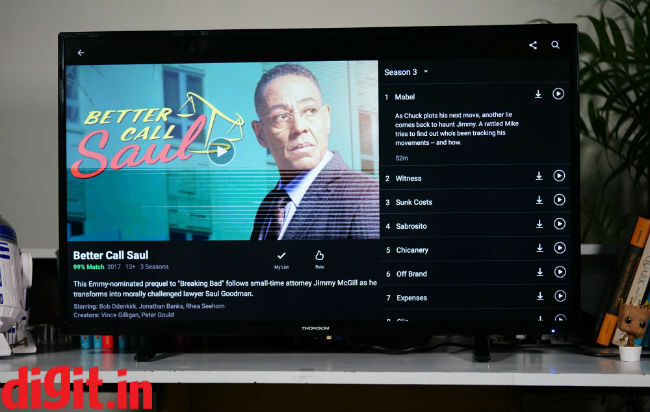 The Netflix app on the TV is the mobile version of the app and to make the most of Netflix, we recommend using it through a device such as a gaming console or a Chromecast or a Fire TV stick. A mobile version of a streaming service on a TV isn’t acceptable. The app store also gives you access to apps like Popcorn Time, but it wont run without a VPN. Good luck getting a VPN to run on the TV. You also don’t need to sign in with your google account to access the app store. Overall, the UI of the TV is convenient to use. And will get the job done if using a Smart TV isn’t your thing. However, to have a smoother smart TV experience, I recommend using a fire TV stick. The TV is pretty loud even at 40 percent volume and that is a good thing. It doesn’t crackle until you turn it up quite a bit. It will fill the average sized living room with loud sound. Watching news and soap operas on this TV should be fine. However, movie and music feels ok. You should invest in speakers or a soundbar to enjoy movies. The remote control that you get with the TV is functional. 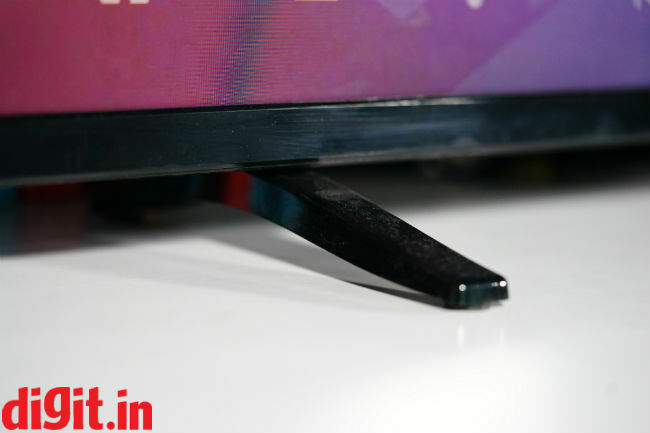 Its plastic, the buttons are rubbery and unlike some other TVs that we’ve tested, you don’t need to point the remote directly at the TV to get the job done. If you block the IR receiver (located at the bottom right of the TV), you won’t be able to use the remote, so keep that in mind. The fav+ button on the remote doubles up as a screenshot button as well. The one thing that’s annoying and funny is the placement of the home button. Ergonomically, it is perfectly located, however it wasn’t so easy to find. I handed the remote to three of my colleagues and they couldn’t find the home button. It is the one at the bottom right of the remote and looks more like an arrow than a home icon. It’s funny, a small nit-picking problem to have, but it’s there. 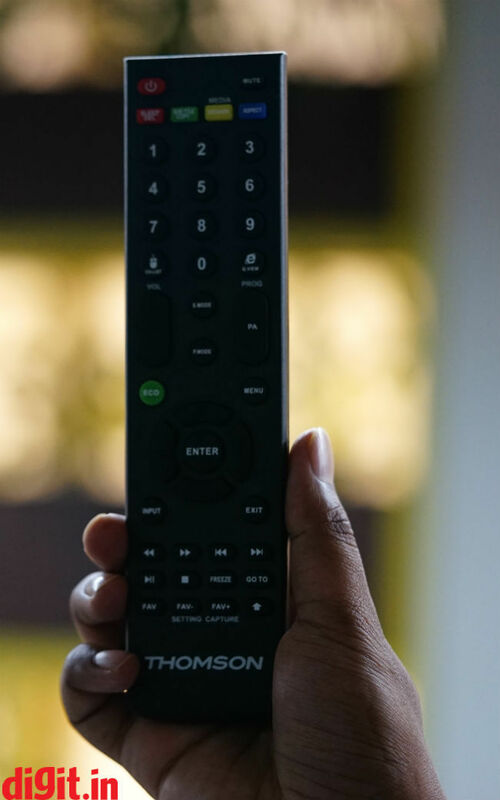 The remote also has a mouse icon to use a pointer on the screen but don’t expect to wave the remote in front of your TV like a magic wand, it won’t work that way. 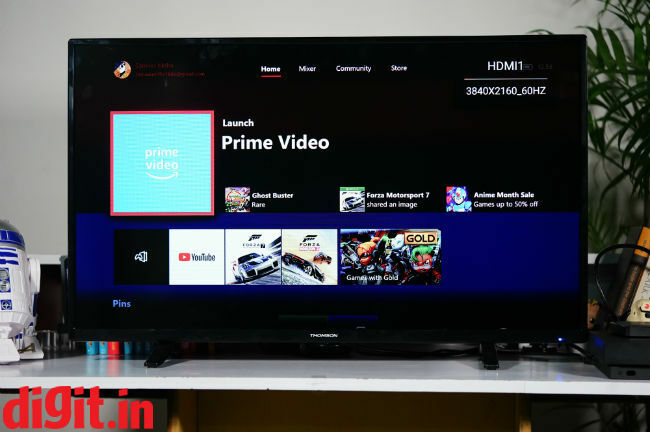 Like we said earlier, we haven’t tested a large number of TVs in the 20K price range which includes TVs like the 43-inch Mi TV 4A, Panasonic 40-inch Full HD TV, Cloudwalker 43-inch Full HD TV, TCL 40-inch full HD TV. So, it’s hard to judge the picture quality at this price point. However, for the price, you get a TV that gets the job done for everyday everyday set top box TV viewing with the occasional movie thrown into the mix. The viewing angles of the TV are good and it will handle natural light reflection in your room better than other TVs thanks to the IPS panel. However, if you are looking for a TV for gaming, entertainment and picture quality is a priority, then we recommend you increase your budget. 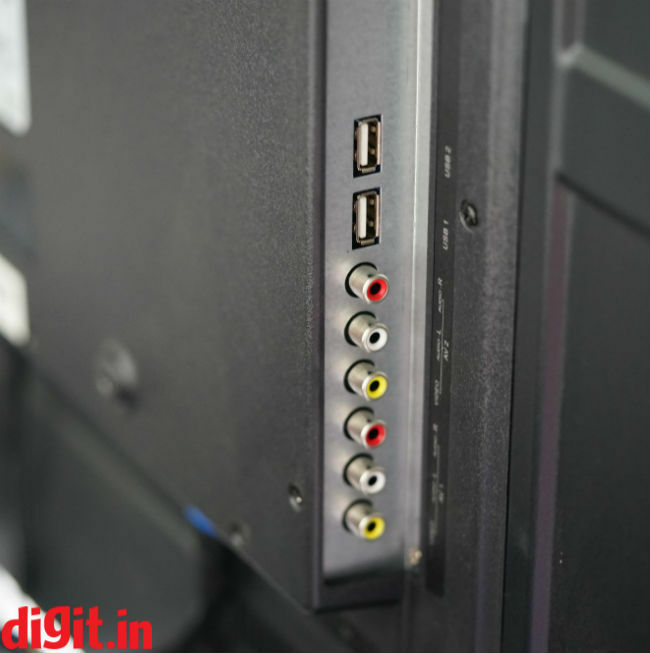 The audio from the TV gets the job done for everyday news and TV viewing.